More and more people are discovering the virtues of perennial ground covers and mulching. Compared to lawn grass, they save on water. And, if deer are a problem in your area, learn about ground cover plants that are good for deer control. These are some low-growing perennials that deer will not generally eat. Fortunately, there is no shortage of such perennial ground cover plants, plus short shrubs such as Blue Rug juniper and Blue Star juniper. Many deer-resistant ground covers are also shade-tolerant, which solves yet another landscaping challenge. Plants that humans find aromatic often have the opposite effect on deer. The deer find their smell offensive and leave them alone, making these plants effective for deer control. There are two pachysandras to consider when deciding on ground covers for deer control. Japanese pachysandra (Pachysandra terminalis) and its American relative, Allegheny spurge (Pachysandra procumbens), both grow to about 1-foot by 1-foot. In North America, the Japanese pachysandra is the more vigorous ground cover and will fill in an area faster. But these two pachysandras are equally effective in deer control. Hardiness: Both of them can be grown as far north as USDA plant hardiness zone 5. In zones 7 to 10 they are evergreen ground cover plants. Native vs. foreign: Allegheny spurge (Pachysandra procumbens) is a perennial groundcover native to the eastern U.S. from Kentucky to Florida. It is favored by lovers of U.S. native plants. Meanwhile, its counterpart hails from Asia. Shade lovers: Both ground cover plants should be grown in soil rich in organic matter. Keep them well-watered, but also make sure the soil drains well. Although tolerant of sun, both pachysandras are usually grown in shady areas. You might as well take advantage of their tolerance of shade since shady areas are often problematic in landscaping. In full shade, pachysandra's foliage is a more attractive, darker green. Its leaves get lighter, the more sun it gets. As fall approaches, the foliage of Allegheny spurge becomes dappled with silvery flecks. In spring, Allegheny spurge produces spiky, fragrant flowers ranging in color from white to pink. Japanese pachysandra has a white flower. If you want more of them, you can take cuttings of the stems or leaves of both types of pachysandra. But since pachysandra spreads via rhizomes, it is easier just to divide it in the spring. Dig under your plants and inspect the rhizomes. Below each node, you will see roots feeding some vegetation above. Make your cuts at these nodes to divide the plants. "Grass is grass," you say? When most people mention grass, they are talking about the common lawn grasses that many of us have been mowing since our childhoods. But some grasses are not meant to be mowed. They are known as "ornamental grasses." Like the pachysandras described above, ornamental grasses can serve as substitutes for lawn grass. Northern sea oats: Chasmanthium latifolium is an ornamental grass that grows 24 to 36 inches high in loose clumps of green foliage. Its name derives from its seed pods, which look like oats. This deer-resistant ornamental grass is cold hardy to zone 5. Even after its leaves have dried and died, it provides visual interest to the winter landscape. Blue oat grass: Helictotrichon sempervirens is a cool-season ornamental grass that can be grown in USDA plant hardiness zones 4 to 8 and is effective for deer control. This ground cover attains a size of about 2 to 3 feet high (with a similar width) and grows in a mounded shape. Grow it in full sun and well-drained soils if you wish to enjoy the signature blue hues of its foliage to the fullest. The plant also produces spiky, dark flowers with a bluish tint in summer that turns harvest gold in autumn. Lilyturf: For a shorter ground cover, try Liriope spicata. Lilyturf is commonly grouped with the ornamental grasses but actually is not a true grass. It can be grown in zones 4 to 10 and reaches only about 1 foot in height. It likes water, but it also prefers well-drained soil. Select an area with partial shade and soil rich, in organic matter for best results. 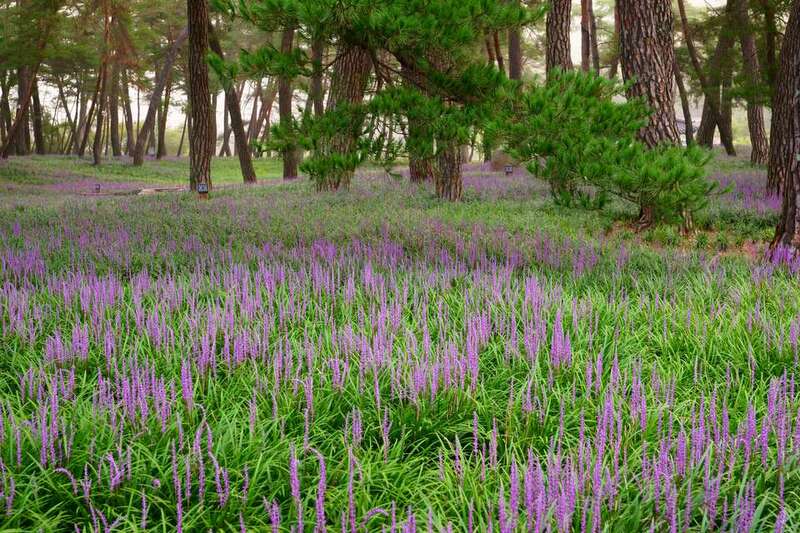 This grass-like plant, too, has a spiky flower, ranging in color from white to lavender. In autumn it bears a dark berry. You will want to contain it, however, because it is invasive. Bugleweed: Also called ajuga (Ajuga reptans), this invasive plant is not eaten by invading deer, making it useful for deer control. It bears a bluish-purple bloom. Ajuga can be grown in zones 3 to 10 and generally stays short, although when in flower, it gains a few inches. Ajuga is easy-to-grow—too easy, really. It will grow in sun or part shade, and it is not fussy about soil so long as the drainage is good. It will form a dense mat and provide you with both attractive foliage and flowers. But it will pop up all over the landscape, often in places where it is unwelcome. Creeping myrtle or periwinkle vinca vine: Vinca minor is a perennial ground cover widely used as a grass substitute in lawn areas and effective in deer control. Grown in zones 4 to 8, creeping myrtle requires good drainage. This shade-loving, deer-resistant ground cover is often planted under large trees, where the homeowner's choice of lawn grass would quickly have given up for lack of enough sunlight. Creeping myrtle's vine grows only 3 to 6 inches off the ground, but its trailing stems with evergreen leaves spread up to 18 inches. The stems root at the nodes as they creep along the ground and spread rapidly to form an attractive ground cover. While attractive, it is invasive. Keep it in check to avoid having it spread where you do not want it to. Creeping myrtle puts out a bluish-lavender flower in spring and blooms here and there throughout summer. Yellow archangel (Lamium galeobdolon) and deadnettle (Lamium maculatum): These plants are close relatives. Both are invasive (although yellow archangel is the worse offender), variegated, and shade-loving perennials in need of good drainage. They are useful for landscapers seeking deer control. They can be grown in zones 4 to 9 and attain a height of 1 to 2 feet with a similar spread. Yellow archangel has yellow flowers, deadnettle has purplish or white flowers, both are prized more for their leaves. The leaves of yellow archangel are a medium-green color, interrupted by splotches of silver. Deadnettle leaves have more silver in them than green. Once established, both are considered good plants for dry shade. Deer-resistant ground covers need not just sit there and look pretty. Many herbs make great ground covers and bring much more than just visual interest to the landscape. Besides being ornamental, herbs can be edible and can have medicinal uses. The herbs discussed here are all aromatic but not to deer, who refuse to eat them precisely because of their smell. Catnip: Nepeta cataria, as well as the various other types of "catmint," may not be aromatic to deer, but humans find their fragrances pleasing. Catnip is not just for cats—it has medicinal uses for humans, as well. Tea made from the leaves and flowers of this herbaceous perennial has traditionally been used to relieve coughs. Sun or part shade is best for growing catnip, and it is not overly particular about soil conditions, so long as the soil is well-drained and slightly alkaline. It can be grown in zones 3 to 9. Catnip can attain a size of 3 feet by 3 feet. Sweet woodruff: Galium odoratum, like catnip, is an aromatic perennial for zones 4 to 8. It has a white bloom and reaches 8 to 12 inches in height (with a slightly greater width). This perennial ground cover is a shade-lover. Like most herbs, it requires good drainage and slightly acidic soil. Somewhat invasive, sweet woodruff spreads to form a mat over the patch of landscaping that it conquers. Plant this old-time favorite in dry shade if you do not want it to spread. A lower level of moisture makes it less invasive. The intensity of the fragrance of sweet woodruff's foliage increases when dried, and its aromatic quality lasts for years. It is a favorite in potpourris. Common thyme: Thymus vulgaris has a pleasing fragrance, is drought-tolerant and tends to stay shorter than catnip and sweet woodruff (about 6 inches tall with a similar spread). It is an herbaceous perennial in zones 5 to 9. Although it does flower, it is grown mainly for its delicate foliage, edible uses, and aromatic quality. Thyme likes full sun and good drainage. An ideal ground cover to plant in the cracks of a flagstone patio or stone walkway, or between garden stepping stones, is common thyme's relative, woolly thyme (Thymus pseudolanuginosus). Woolly thyme is one of the creeping varieties of thyme. Most gardeners grow these plants for their leaves, not their blossoms. All of them should be grown in full sun. Lamb's ear: Grown in zones 4 to 7, this is one of the few plants that one grows in the garden as much for the sake of touching it as for the sake of looking at it. In fact, that is how it got its common name. The leaves are as soft to the touch as are the ears of a fuzzy little lamb. When not in flower, it stands about 8 inches tall with a spread of about 12 inches. Emerald Gaiety Euonymus: This perennial shrub is deer-resistant and can be used as a ground cover. Its bicolored leaves are green and white, but the white part is strong enough to create an overall impression of brightness. Grown in zones 5 to 8, it gets to be 3 to 5 feet tall with a somewhat greater width. Yellow loosestrife: Grown in zones 4 to 8, this plant also has bicolored leaves. It is at its best when the plant first emerges in spring; its color is green and pink. After this great spring display, yellow flowers come after that as a bonus. Standing 1 to 2 feet tall when fully grown, its width is slightly less than that.